This is our most sought out rental home, but it is not for the faint of heart! 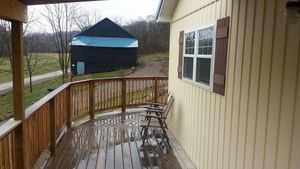 A long, windy drive over the occasionally flooding creek along State Route 690 and uphill brings you through a covered dual garage to this Country Rental A-frame Home in Athens. Loads of glass and privacy in the woods above the world! One bedroom and bath on the first floor along with washer/ dryer, large living room, and kitchen. A second floor loft is accessible from the spiral staircase. Owning a 4 wheel drive vehicle is recommended. Requires some effort from the tenant to maintain the cistern/ well water source. No central air, but it does stay cool due to the wooded area. 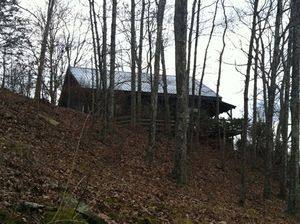 You will love this secluded Country Rental Home in Athens! No mowing really required! You manage the flower beds. Rent $900 includes* free water and gas heat while the wells last...if run out, tenant will be responsible for utilities. Two pets allowed. Pet deposit required. We built this new 2 bedroom rental home on Dutch Creek Road in place of an old historic, dilapidated home and coined it the Civil War home. It features an open floor plan, all natural wood décor, a full bath with tub and stacked washer/ dryer. The large kitchen has room for a small table and features newer appliances and a dishwasher. Enjoy the peace of the valley on the large front porch, at the fire ring in the evening, or while you toil in your vegetable or flower gardens. A historic old barn offers opportunities for storage, studio space, or chickens. No central air conditioning. All electric heat. Two pets allowed. Pet deposit required. We provide the lawn mowing. You manage the flower beds. 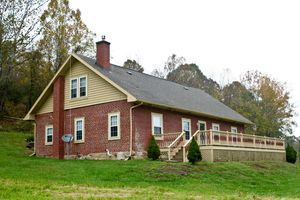 The Baron's Brick Farmhouse on Dutch Creek Road is a very historic home built on the foundation of an old log home built by the Baron Johann Rudolf de Steiger. The main level is the main living area. It features lovely hardwood floors, great tile work in the kitchen, large living room with fireplace, full guest bath, master bedroom with in suite bathroom & fireplace, laundry, and a dining room. The upstairs is a divided "bonus" room. The lower level is an old cellar. Central Air Conditioning and gas heat. A sun room with stone patio compliments the ambiance. Detached single car garage. Extra storage in historic barn on site. Two pets allowed. Pet deposit required. We provide the lawn care, you manage the flower beds. 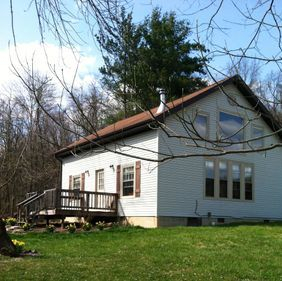 The Country Home sits closer to Route 550 instead of 690 on a private, wooded lot on Dutch Creek Road. This home is one of our favorite because of its open floor plan between the living room, dining, and kitchen under the cathedral ceiling. A wood stove keeps it toasty in the winter. Large windows provide tons of sunlight and a wonderful view of the wildlife. The first floor also offers a bedroom, full bath, and laundry. The unique floor plan offers a loft style master with full bath upstairs.